Have you ever been to Cambodia? If so, have you noticed that everyone there has a mobile phone? Whether you are in Phnom Penh, Siem Reap or even in the countryside, you’ll find people talking on their cell phone all the time. As in other developing countries, mobile penetration is very high in Cambodia. More than two-thirds of the populationuses a cell phone on a regular basis, and there is a pretty good GSM coverage in most regions. For the country, which is one of the poorest in Southeast Asia, this is very good news, as it may contribute to a sustainable development momentum. Mobile phones have proven to be a great technology to empower the Base of the Pyramid in other countries, and there are benefits that you may not even imagine. For instance, did you know that cell phones can help people have a better access to electricity, even in the most remote rural areas? In India, Simpa Networks has developed a Pay-As-You-Go model to enable 60,000 off-grid households to buy solar home systems by 2015. In Cambodia, a project using mobile technology has recently been started by Kamworks, a social startup whose objective is to bring innovative solar energy solutions to the rural poor. The need for affordable and accessible energy is huge. Today, 10.5 million Cambodians live without grid electrical power. Experts say the situation is particularly critical in rural areas where nearly 70 percent of the households have no access to electricity. Why is it so? In many regions, there is no grid power at all; and, where people could be connected, they often cannot afford it. Most villagers have no choice but use kerosene lamps or car battery-powered lights. In the longer run, unfortunately, these products are not only expensive, but they are also inefficient, dangerous, unhealthy, and polluting. When Kamworks was started in 2006, the idea was to offer sustainable alternatives to the rural people; and this is why the company’s founders opted for solar solutions. 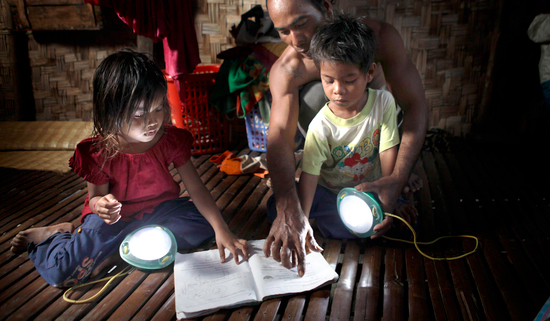 With an average of five hours of full sun each day, Cambodia is a perfect place for solar lanterns and home systems. In addition, since fuel price has increased over the years, solar technology has become more and more competitive as its price has fallen. Then economic benefits of solar have proven to be real and short-term as well as long-term. Difficulties usually arise, though, when it’s time to pay for a solar system. While many villagers are willing to buy solar products, the majority cannot afford the high up-front investment. To solve this issue and enable its customers to have access to solar power, Kamworks has had to be creative over the years and develop various business models. In 2007, it started renting products, and this has turned out to be among the most effective solutions. Yet there is still a major problem: higher collection costs for the company, and sustaining such a model was difficult in the long run. Today, the answer will come from cell phones and mobile payment technology. Customers renting Kamworks’ solar home systems will soon be able to pay for the rental fees through their mobiles. For the company, this will be easier to manage; and for the customers, as they won’t have to pay upfront for the product any longer. So they will be more likely to make the leap, and go solar for their electrical needs. Of course, you could wonder, “Why is it so important to have power?” Specialists agree that access to electricity is actually a key to sustainable development. To put it clearly – where there is no light, both economic and human development goals are harder to achieve. In Cambodia, night falls at around 6 pm. Keeping the light on until late weighs on villagers’ financial resources, and ultimately it can have an impact on livelihood, education and even quality of life. But imagine – if the Base of the Pyramid had an easy access to affordable electricity, it could transform their lives. Children would be able to study in better conditions after dark; businesses would operate longer hours; and farmers could even have access to modern tools to produce more. Last but not least – they would stop poisoning themselves with kerosene-induced indoor pollution. No wonder the United Nations placed the question of sustainable energies on the global agenda for the coming decade and we should celebrate innovations like mobile payments for Kamworks solar systems. According to the WHO, tuberculosis is the biggest infectious-disease killer, taking more lives than AIDS, cholera and other pandemics combined. There are 8 million new cases in the world each year and 1.8 million deaths, even though it is a fully curable disease with the right treatment. In response, Dr. Shelly Batra and Sandeep Ahuja founded Operation ASHA in 2005 with a compelling vision: a tuberculosis-free India. Operation ASHA has grown to become the exclusive provider of tuberculosis (TB) treatment to nearly five million Indian citizens. Operation ASHA uses eCompliance, a comprehensive low-cost technology solution for tracking and monitoring TB patients that is constantly being upgraded to suit the needs of the people. Recently, their technology team launched a text free version of eCompliance to be used in zero literacy areas such as the tribal areas of Madhya Pradesh and Jharkhand in India, and transitioned eCompliance from netbooks to tablets for improved efficacy and cost-efficiency. In recognition of her success in scaling treatment of TB in India and Cambodia, Dr. Shelly Batra, President & Co-Founder of Operation ASHA, was selected by Schwab Foundation as Social Entrepreneur of the Year 2014. Congratulations Dr. Batra, and keep up the good work! The ISIF Asia Awards seek to acknowledge the important contributions ICT innovators have made with creative solutions to the social and economic development of the Asia Pacific region. 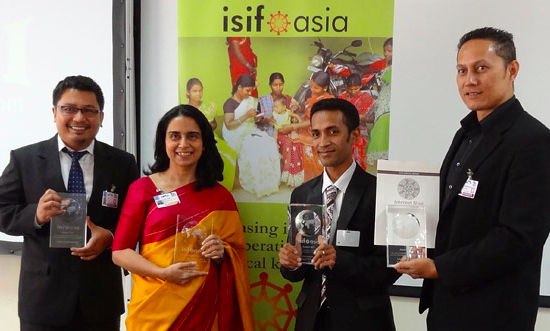 The ISIF Asia Awards are granted to initiatives on the last stages of implementation or that have finalized activities already that are aligned with the funding categories and eligibility criteria. Financial support for up to AUD 3,000 is allocated via a competitive process, plus a travel grant to attend the awards ceremony at a regional or global event chosen by the ISIF Asia secretariat. Innovation and a development focus should be an integral part of all award nominations. Innovation on access provision: Access to Information and Communications Technologies (ICTs) is a prevalent issue in the Asia Pacific region, especially for services that require broadband connectivity. Innovative solutions offering low cost deployment, low power consumption and low maintenance that expanded fixed and mobile access to the internet through new forms of technical and organizational arrangements as well as improved the quality of access based on issues of accessibility, disability and linguistic diversity. Innovation on learning and localization: Capacity building and localization efforts have been key to develop the skills needed to design, maintain, and manage ICT infrastructure and services in local languages, supporting local talent and creating job opportunities in rural or urban marginalized areas. Innovative, open, inclusive and sustainable approaches to learning and localization are key elements to guarantee the quality of access to knowledge needed to offer reliable services and applications. Code for the common good: High mobile penetration in the AP region has been a catalyst in the development of mobile-based services, applications and software solutions. 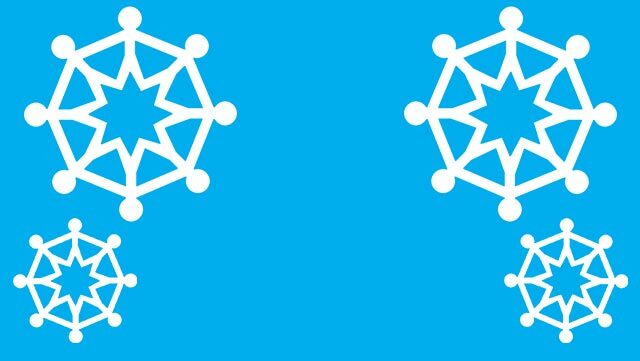 These solutions have been used to support timely and relevant information dissemination on a large scale using a range of network infrastructures through a variety of devices, even where literacy rates are lower. 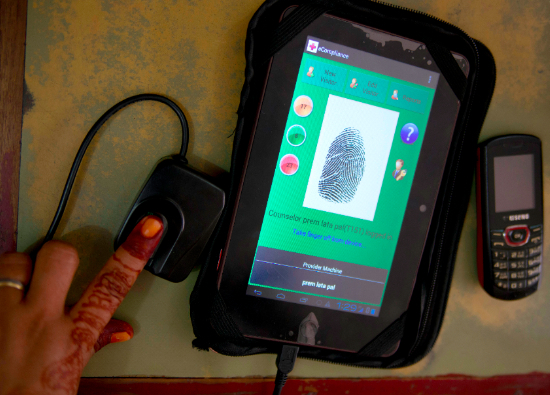 Mobile technologies have enabled communities to increase participation in political processes, coordinate efforts during emergency situations, receive extreme weather alerts, communicate with remote health services, and receive specialized patient referrals, among many other applications. Rights: Strategic use of Internet tools and services to promote freedom of expression, freedom of association, privacy, security, consumers’ rights, gender equality, new forms of intellectual property in the digital environment, and a wider range of issues related to the Internet and human rights. In addition to selecting a winner per category, a Community Choice Award will be granted to the best social media campaign (the project with the highest number of votes from the community).